For eight years French soldiers fought a brutal asymmetric war against insurgents determined to forge their own destiny. In traditionally Roman Catholic countries All Saints’ Day—observed on November 1—is a liturgical festival during which people light candles for deceased loved ones and place flowers on their graves. Preceding the day’s events are the rites and rituals of All Hallows’ Eve—a precursor to present-day Halloween—also devoted to remembering the departed, including saints (hallows) and martyrs. For the French people Nov. 1, 1954, was Toussaint Rouge—Red All Saints’ Day—marred by a spate of deliberately timed, well-orchestrated bombings of police stations, utilities, fuel depots and public buildings across urban northern Algeria. The Muslim nationalists who carried out the attacks did relatively little damage and killed only seven people, but they succeeded in sparking an eight-year, textbook asymmetric war—defined as a conflict between a large, mechanized, professional army and a smaller group of lightly armed but resilient guerrillas. History’s last major anti-colonial conflict, it was a struggle with many martyrs but few saints. Even as the fighting escalated, however, the French government was reluctant to call it a war, preferring to term its intervention “police operations” or “actions to maintain order.” In 1848, nearly two decades after the 1830 invasion, officials had organized occupied Algerian territories into official departments of France, not colonies or protectorates, as in French-occupied Tunisia and Morocco. To the French going to war with Algeria was equivalent to going to war with Normandy, or England going to war with Yorkshire, or the United States going to war with South Carolina. Not until 1999 did the French National Assembly finally admit, like it or not, it most certainly had been a war. Whatever one called it, the fight in Algeria was brutal, marked by massacres, atrocities, torture and indiscriminate bombings. The Algerian insurgents employed more rudimentary forms of butchery and mutilation, including widespread throat-slittings the French soldiers dubbed the “Kabyle smile,” after a region thick with insurgents. French paratroopers and commandos, meanwhile, favored such modern methods as sleep deprivation, an early form of waterboarding, sexual humiliation and/or torture by field-telephone generator. The French also guillotined prisoners or simply made them disappear. By the time hostilities broke out in Algeria in 1954, French airborne troops, commandos and Foreign Legionnaires were among the world’s most battle-hardened, competent and professional combatants. Some had fought the Germans with la Résistance in World War II, while others had campaigned as uniformed Free French tankers, infantrymen and pilots. Many had immediately returned to combat, shipping off to French Indochina in 1946 and fighting eight more years until their ultimate defeat by the Viet Minh at Dien Bien Phu. That blow, added to the lingering disgrace of the 1940 capitulation to Germany, left the French soldiers bitter and brutal. Protesters for and against Algerian independence fight one another during one of many such street demonstrations in France. The Algerian conflict acquired an added measure of complexity in being a fractionalized fight. The French army despised the dithering Fourth Republic politicians back in Paris, and at one point that loathing threatened the French capital with an armed coup by airborne troops from Algeria. The Algerian insurgents themselves were riven with infighting that at times turned as deadly as their war against the French. Most of the country’s Muslims hated the 1 million European colonials—aka pieds-noirs (“black feet”)—who came not only from France, but also from Italy, Spain, Malta, Alsace and other parts of Europe. The colonials returned the hatred in kind. Like South Africa’s Afrikaners during apartheid, they felt they had built modern-day Algeria and were not about to give it up. Then there was the war itself. Most insurgents were members of the socialist Front de libération nationale (FLN). Among its principal leaders was Ahmed Ben Bella, who had fought in the French army during World War II and would eventually become president of independent Algeria. In 1954, however, he was busy teaching his paramilitary Organisation spéciale the tactics Ho Chi Minh had used against the French in Indochina. His 1,200 or so insurgents were ill-equipped and -trained, and their initial attacks did little damage, but as their numbers grew, so did their experience and ingenuity. The French were unprepared for the war. Though they had some 56,000 troops in-country, only 4,000 were combat-ready. In some areas peacetime orders required soldiers’ rifles be unloaded, with cartridges literally sewn into ammunition pouches. By 1956, however, 200,000 French soldiers had shipped out to Algeria, a number soon to double. An increasing number of them were conscripts. One unusual feature of the war was the Morice Line, named after André Morice, who was French minister of defense when crews completed work on the line in September 1957. Algeria was bracketed by Morocco to the west and Tunisia to the east, both newly independent and fiercely Muslim countries that afforded Algerian insurgents natural safe zones and served as wellsprings for recruits to their cause. France’s answer was to erect walls along the borders of both countries—285 miles long from the sea to the trackless Sahara on the Tunisia side, 435 miles bordering Morocco. The core of each defensive line was an 8-foot-high, 5,000-volt electric fence backed by barbed-wire entanglements and bordered on each side by 150-foot-wide minefields. What made the barriers truly effective was an interconnected mix of high-tech sensors, searchlights and alarms, coordinated with artillery and supported by infantry patrols and aerial surveillance and reconnaissance. Few insurgents breached the Morice Line—though they tried both tunneling beneath and ramping over it. The French employed a variety of aircraft during the conflict, from Sud-Est Mistral jet fighters (French-built versions of the British de Havilland Vampire) to U.S.-built North American F-100D Super Sabre jets on photo recon missions from bases in France. Among the most effective warplanes were two of the least likely: the North American T-6G Texan advanced trainer and the Piper Cub. Algeria’s interior is alternately hilly and mountainous, pocked with caves and ravines that served as hideouts for the insurgents. The faster fighter-bombers had a hard time finding and hitting such small targets, but the T-6s—dubbed the “yellow planes” by insurgents, as most of the 300 based in Algeria retained their high-visibility trainer paint scheme—were slow and maneuverable enough to put bombs, machine-gun fire, rockets and napalm on target. They proved excellent counterinsurgency aircraft. For similar reasons the low-speed Cubs were perfect forward air controllers that could consistently spot targets. The Algerian insurgents had few anti-aircraft weapons with which to counter them, at least not until late in the war, when the Soviet Union began contributing weapons. The French also purchased 50 brand-new Douglas B-26B Invader twin-engined light bombers from the United States —aircraft that had gone straight from the assembly line into post-World War II storage when the U.S. Air Force cancelled the contract. Late in the war the French converted several of the Invaders into night fighters to intercept inbound arms-smuggling flights. Fitted with radar in the Plexiglas nose and four .50-caliber machine guns and two air-to-air rocket pods beneath each wing, these B-26Ns might have proved effective, but smuggling flights became rare as the war wound down, and the Invaders made no intercepts. But it was the helicopter—which the French called the ventilateur or ventilo (“fan”)—that made the biggest contribution to the Algerian fight. As the growing French helicopter industry was still striving to conceive combat-ready designs, the Armée de l’air began the conflict with three main helicopter types from the United States: the twin-rotor Piasecki H-21—dubbed the “Flying Banana” for its fuselage shape—the Sikorsky H-19 and its direct successor, the H-34. The French used the 20-passenger Banana to rapidly deploy troops, developing the air-mobile concept that has proved so useful in subsequent asymmetric wars. They also invented the helicopter gunship by arming both the H-21 and H-34 with flexible and forward-firing machine guns as well as rocket pods. In an attempt to deny the guerrillas civilian support, the French instituted a harsh policy of “collective responsibility”—ironically, much as the Nazis had in occupied France. Thus if FLN guerrillas found refuge in a village, the entire village suffered the consequences. In the event of a terrorist bombing, the French assigned responsibility to the nearest village. Soldiers mounted search-and-destroy ratissages (“rat hunts”) for rebels throughout the countryside. The FLN, for its part, abducted, tortured and killed tens of thousands of Algerians who had any contact with the French, no matter how innocent. In a notorious August 1955 incident centered on Philippeville in coastal northeast Algeria the FLN assaulted a number of villages and massacred 123 pieds-noirs, including women and children. The attackers gang-raped women before killing them and mutilated their victims’ bodies. According to FLN claims, vengeful French paratroopers killed 12,000 Muslims; the French admitted to 1,273 such reprisal deaths. Whatever the toll, the massacre and reprisals swept away any hope of solving the situation by political compromise. The killings also precipitated a rapid increase in the number of FLN sympathizers and recruits, and soon the FLN had a real army—the Armée de libération nationale (ALN). Nevertheless, the insurgents were foot soldiers, unable to match the rapid reaction of the air-mobile French, who could carry out in 20 minutes what might otherwise require a two-day march in mountainous terrain. The French also had superb coordination and communication among units, as well as commands with no inter-service rivalries. Air support was usually just minutes away, and airborne troops were ready to saddle up at a moment’s notice. In January 1956, for example, commandos airlifted by two H-19s surprised a gathering of insurgent leaders and captured six of them. Meanwhile, an observer in a circling Piper spotted a large rebel band nearby, and French commanders diverted the H-19s to strategically deploy 120 commandos in multiple flights. Attacking the insurgents from ambush, the French captured or killed 43 Algerians and seized a cache of arms. By June 1956 the insurgents had some 1,400 guerrillas within Algiers’ Casbah, the capital city’s ancient, windowless, labyrinthine Arab quarter. After the French guillotined two rebel leaders that month, FLN gunmen carried out random attacks, killing nearly 50 pieds-noirs. The FLN also carried out multiple terror bombings, sending Algerian women in Western dress and makeup to plant charges in cafés and nightclubs frequented by Europeans. The colonialists retaliated, and gunfights, ambushes and explosions became daily occurrences. In January 1957 city administrators, realizing they had lost control, gave the army full authority throughout the metropolitan zone. Spearheaded by four regiments of paratroopers, the force was given carte blanche to deal with the insurgents and anyone else who got in their way. By late March the soldiers had managed to push deep into the Casbah and capture or kill most of the FLN leadership. What became known as the Battle of Algiers—the subject of Italian director Gillo Pontecorvo’s popular 1966 war film of the same name—was a disaster for both sides. Though the French ostensibly won the fight for the city by eliminating the rebel threat, the reported disappearance of some 3,000 Muslims and the paratroopers’ use of torture and other brutal methods increasingly turned the French public against the war. Meanwhile, the French had pulled off one of the conflict’s more controversial operations. In granting both Morocco and Tunisia their independence in March 1956, France had unintentionally created neighboring sanctuaries for Algerian insurgents. That October four FLN leaders, including Ben Bella, and a number of journalists (including a New York Times reporter) were flying from Morocco to Tunisia aboard a French-registered and -crewed Royal Air Maroc Douglas DC-3 when French officials radioed the pilot to divert the aircraft to Algiers—a flagrant violation of international law. The Algerians thought they were in Tunis even as the DC-3 taxied to the terminal, believing the large number of vehicles and camouflage-clad soldiers on the tarmac to be a welcoming committee. But officials soon welcomed Ben Bella and the other FLN heavyweights to a prison in France, where they remained for the duration of the war. On Feb. 8, 1958, 11 French B-26s bombed the Tunisian village of Sakiet Sidi Youssef, from which an ALN battalion had crossed into Algeria, ambushed a French patrol and returned with five prisoners. The air raid destroyed rebel installations but also struck a school and Red Cross trucks bearing refugees, killing 75 civilians and wounding nearly 150—a tragedy that horrified the French public and further turned international opinion against the war. Workers put finishing touches on the Morice Line, a barrier intended to keep Algerian insurgents from safe havens in Morocco and Tunisia. In early 1958 the French inflicted terrible losses on the insurgents, and within months ALN casualties mounted into the tens of thousands. Yet decisive victory eluded the French, and the combat units—particularly the paratroopers—became increasingly restive. They had been fighting for years, yet all they read or heard was increasing sentiment, at home and internationally, for an independent Algeria. 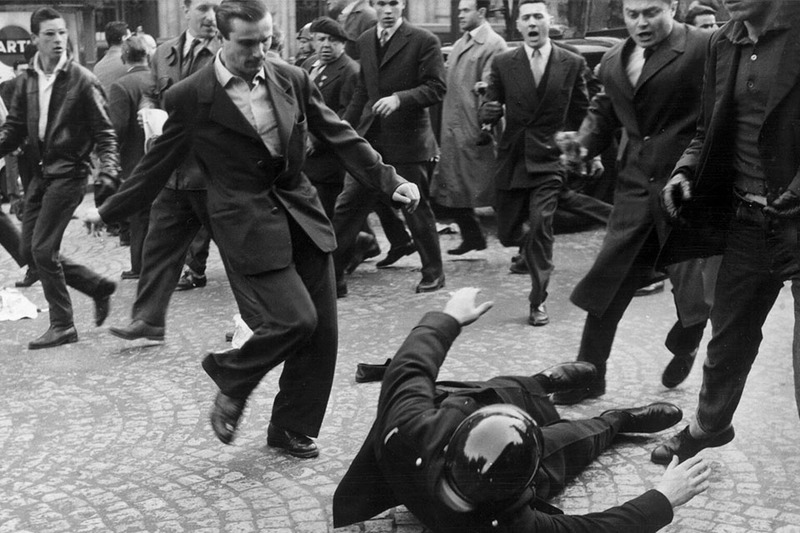 They blamed the politicians in Paris for not fully supporting the war effort, and their anger spawned an abortive coup in May 1958 that threatened to erupt into a civil divide. Under pressure the government of the Fourth Republic resigned. Into the power vacuum stepped French war hero Charles de Gaulle, who ushered in the Fifth Republic and promptly helped draft a new constitution. But if proponents of an Algérie française expected a shift in support of the ongoing war, de Gaulle was to bitterly disappoint them. De Gaulle was inaugurated president of France in January 1959, sailing in on his sterling reputation as leader of the Free French in World War II. He was cautious about enunciating his position regarding Algeria, where he had been headquartered during the war. The pieds-noirs and soldiers may have assumed he was on their side, but de Gaulle wanted to honorably withdraw the army and allow Algerians to determine their own fate while retaining a fraternal bond to France. In a January 1961 referendum on Algerian self-determination three-quarters of French voters approved such a policy. The people were tired of war, and as many of the troops were conscripts instead of career military, their families wanted them home. The career soldiers disagreed, and that April a group of dissident generals and a cadre of paratrooper officers seized power in Algiers and announced their intention to install a government of pieds-noirs as soon as they had defeated the ALN. They held the city for five days before the revolt—which had little public support either in Algeria or on the mainland—collapsed. In the meantime, air force fighters patrolled the skies over France with orders to force down any aircraft headed for Paris, and tanks parked on the city’s boulevards awaited the threatened airborne assault from Algeria. French authorities ultimately arrested several generals and more than 200 officers and dissolved the mutinous 1st Foreign Parachute Regiment. But the dissidents were not done. Disaffected generals, officers and pied-noir extremists founded the Organization de l’armée secrète (OAS), which sought to derail the independence movement and earnestly attempted to assassinate de Gaulle. The waning days of the war were its bloodiest, as the OAS and ALN and their respective supporters indulged their bloodlust in assassinations, bombings and further massacres. By 1961 the Soviets were smuggling arms into Algeria and neighboring Tunisia, including 30 mm anti-aircraft guns that enabled the insurgents to do real damage to French air assets. The French shot down at least one Soviet Ilyushin Il-14 cargo plane and damaged another off the Algerian coast. Meanwhile, de Gaulle continued his efforts toward disengagement. The FLN, realizing the war would end in independence no matter what its losses were, turned its efforts to establishing a well-equipped, 20,000-man conventional army, stationed in Tunisia. Its mission was not to fight the French but to await their inevitable departure and then become Algeria’s official army. The war ended with a whimper in March 1962 when the French government declared a cease-fire and the warring parties signed accords granting Algeria independence, which became official in July. The French military had performed superbly, all but destroying the FLN/ALN. Yet politically the insurgents emerged victorious. In the wake of the accords the FLN gave the pieds-noirs a choice it termed “the suitcase or the coffin,” meaning flight to France or death in Algeria. Most fled, but not before FLN troops massacred scores of European residents in Oran, and the OAS bombed hundreds of Algerian targets, both military and civilian, across the country. Casualty estimates from the eight-year conflict vary wildly. French authorities placed their military death toll at more than 25,000, with an additional 3,000 European civilians killed. Estimates of Algerian war dead range from 350,000 to more than 1 million. What is certain is that Algerian citizens suffered the brunt of the violence, at the hands of both French and insurgent forces. France would never be the same. Its status as a world power was diminished, its army dispirited and resentful. Citizens were embarrassed by what had been done in their name, and for four decades “Algerian War” was a phrase better left unspoken in France. If any good came of the dirty war, it is that its tactical lessons on counterinsurgency operations were learned and relearned in Iraq, Afghanistan and other Middle East conflicts. Fighters of future “asymmetric” wars will doubtless face and learn those lessons again. Stephan Wilkinson has traveled throughout Tunisia and Morocco as a writer for Condé Nast Traveler and is a frequent contributor to Military History. For further reading he recommends A Savage War of Peace: Algeria 1954–1962, by Alistair Horne, and Algeria: France’s Undeclared War, by Martin Evans.